What could be more fun than vacationing in Santa Cruz, CA? At CrossFit Amundson, we have the answer! It’s the WODCationSM! View of the beach across the street from the house. WODCationSM is an action packed 5 or 7 day fully structured vacation in Santa Cruz that will keep you fit and focused, while at the same time providing you a chance to relax and recharge. Offered three times each year for groups of 2 to 5 people, WODcationSM is the perfect opportunity to visit one of the most popular vacation destinations in the World. The CrossFit Athlete’s dream vacation, WODcationSM offers unlimited weekly enrollment at CrossFit Amundson Santa Cruz, and group workouts at CrossFit Santa Cruz, CrossFit Santa Cruz Central and CrossFit West Santa Cruz. Plus, you’ll have an opportunity to participate in two outdoor workouts, one at the famous Seacliff State Beach wooden stairs, and the other at the University of California Santa Cruz outdoor track, where you’ll have a chance to set a personal record on the famous CrossFit WOD “Helen”. In addition to group CrossFit training, the WODCationSM includes two free private classes with Greg Amundson, and a personal Goal Setting Consultation. Two meals are included, one at the original CrossFit hangout the Silver Spur for breakfast, and the other in a more intimate setting at Cafe Cruz. The CrossFit Amundson WODcationSM house is a newly remodeled cottage steps from “Private’s” beach, which is a gated and private neighborhood beach. You will be provided with a key to access this unique private beach and great uncrowded surf spot. 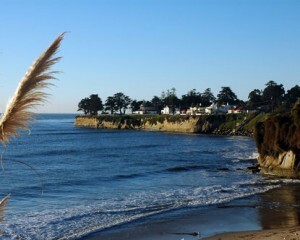 A five minute walk along the ocean will take you to shopping and dining in Capitola Village and awesome Capitola Beach. World famous surf spots the “Hook” and “Pleasure Point” are also just a short walk away. A CrossFit Athlete’s paradise, walk to your own surf break, private beach, and BBQ pit! Surfboad and wetsuit racks are right outside your door in a secure patio area for easy access. The CrossFit Amundson WODcationSM house comes complete with a full kitchen, new stainless steel appliances, and everything you need to prepare a gourmet Zone friendly meal right at home. 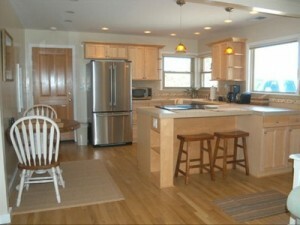 The house has hardwood floors in the main living space and carpeted bedrooms. Surf themed art work fill the house with a laid back vacation feel. The Bali room has a queen bed and tropical décor with a walk-in closet and a view of the landscaped patio. The Captiva room is a bright summer themed room with two twin beds and a closet. This room also accesses the landscaped patio. Relax in the sun with the outdoor dining table and chairs surrounded by flowers and birds, including hummingbirds. The patio deck is perfect for barbecuing on the grill or relaxing with a glass of wine. Your very own WODcationSM Residence in Santa Cruz! 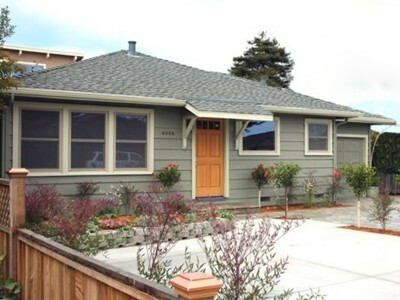 The WODcationSM house is a short 10 minute walk to CrossFit Amundson Santa Cruz and a fifteen minute walk to Whole Foods Market, the perfect organic shopping experience, as well as the charming downtown beach community Capitola Village. Several unique Santa Cruz coffee houses, including our neighbor and friend Coffeetopia are also located conveniently nearby. WODCation’s are either 5 or 7 day experiences offered three times a year. On Saturday of your arrival, our staff will pick you up at the San Jose International Airport in San Jose, CA. Transportation to your WODcationSM house is provided. On Sunday you’ll meet with Greg Amundson for a tour of Santa Cruz and a welcome dinner at Cafe Cruz on Sunday evening at 6:00 PM. Monday: Private Training at CrossFit Amundson with Greg Amundson. Unlimited access to CrossFit Amundson. Tuesday: Group WOD at CrossFit West Santa Cruz at 12:00 PM – the biggest CrossFit gym in Santa Cruz! Run the Seacliff Staris at 3:00 PM. Unlimited access to CrossFit Amundson. Wednesday: Private Training and Goal Setting Consultation at CrossFit Amundson. Introduction to Stand Up Paddleboard at Private’s Beach with our WOD SUP Expert! Unlimited access to CrossFit Amundson. Thursday: Group workout at CrossFit Santa Cruz Central at 9:00 AM. Second WOD at 2:00 PM at UC Santa Cruz Track & Field for “Helen”! Unlimited access to CrossFit Amundson. Friday: Group breakfast at Silver Spur at 9:00 AM. SUP lesson or kayak at the Santa Cruz Harbor as 12:00 PM. Unlimited access to CrossFit Amundson. Saturday: Group coffee at Coffeetopia at 9:00 AM. Transportation provided back to San Jose International Airport. Private Brazilian Jiu Jitsu lesson with World Champion Garth Taylor! Private Krav Maga Lesson with Greg Amundson! Kayak Rental and Monterey Bay Tour! Moonlight Ocean Kayak at the Santa Cruz Harbor! Hiking in the Santa Cruz Mountains! Scuba Diving Lessons and Certification! Deep Sea Fishing on the Monterey Bay! Cook your catch back at the dock! Prepare a Zone friendly meal in your private kitchen! The all-inclusive 7 day WODcationSM is $2,500.00 for groups of 2 and the 5 day WODcationSM is $2,000.00. An additional $500.00 per person with a maximum of 5 persons. Price includes all accommodations, transportation to and from the airport and all activities, all group and private training, and two meals out. The future website for the CrossFit Amundson WODcationSM will be www.WODCation.com. (Note: This site is currently under development.) To register for a WODcationSM or more information, please e-mail: Info@CrossFitAmundson.com.